Goiter research papers explore the condition caused by the enlargement of the thyroid gland. Goiter research paper due and don’t know how to start it? How about like this? Defining goiter overall, it has been noted that this condition is typically caused by an enlargement of the thyroid gland and manifests as a swollen area under the throat at the base of the neck. Generally, this condition is quite overt as the swelling is quite prominently visible. In many cases goiter will only manifest in the neck and the thoracic cavity, however, some cases of intrathoracic goiter have been reported. Although physicians do know that goiter results either from a lack of iodine in the diet or from infection or tumors in the thyroid gland, goiters can develop for no known reason. As such, goiter is in some cases difficult to treat and cure. Hyperpalstic goiter often develops acutely promulgating the development of a large tumor on the neck. Ademomatous goiter typically results from the growth of encapsulated adenoma. Nodular goiter results when the thyroid contains nodules and benign goiter may be smaller and diffuse within the thyroid tissue. In any case, goiter can prompt the swelling of the thyroid gland to more than 100 times its normal size and weight. Autoimmune Thyroiditis - There are two types of autoimmune thyroiditis, depending on the presence or absence of goiters. Goiters are a swelling of the neck or larynx. 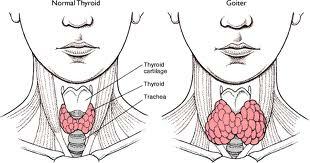 Endocrine Diseases - Thyroid disorders include goiter, hyperthyroidism, thyroid hormone resistance and thyroid cancer. Endocrine System - Goiter research papers explore the condition caused by the enlargement of the thyroid gland. Graves' Disease research papers examine the autoimmune disease that affects the thyroid gland, resulting in hyperthyroidism and an enlarged thyroid. Tay Sachs Disease Treatment - Tay-Sachs Disease Treatment Research Papers discuss that there is no known treatment yet, but there is progress being made in finding a way to treat this disease. E. Coli - E. coli research papers analyze the bacterium that is generally found in the lower intestine of warm-blooded organisms. Tay Sachs Disease - Tay-Sachs Disease Research Papers discuss an overview of this genetic disorder and the causes. Pathophysiology of Ovarian Cancer - Pathophysiology of Ovarian Cancer research papers discuss the known reasons of this cancer such as mutation or deletion of genes. Type 2 Diabetes - Type 2 Diabetes research papers examine the condition that causes the body to no longer produce enough insulin and the cells of the body do not respond to insulin properly. Colon Cancer - This process occurs within a specific organ and this is what causes the appearance of tumors. Anatomy and Physiology - Anatomy and Physiology research writing discusses the two branches in the medical science field. Paper Masters writes custom research papers on Goiter and explore the condition caused by the enlargement of the thyroid gland.